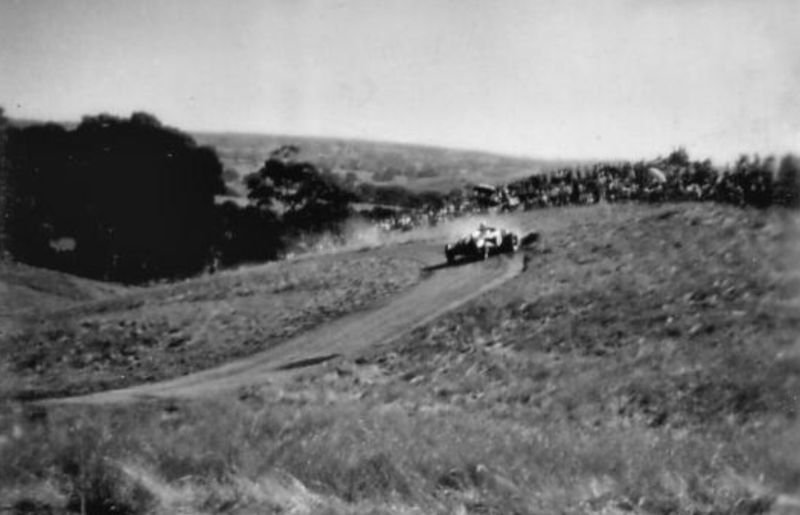 Jones first J2 competition event was the 1950 Australian Hillclimb Championship at Rob Roy in November, he finished 2nd in his class. In 1951 he raced the car successfully at Rob Roy, at Bathurst where he was timed at 104.8mph on ConRod Straight and at other meetings. 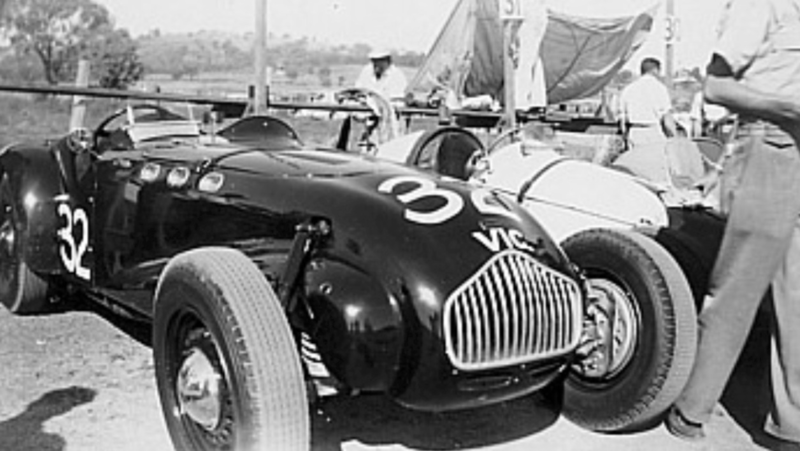 Hawkes raced the car in standard form for a while and then engaged Melbourne’s Ern Seeliger to modify it by fitment of an Ardun OHV engine kit and Jaguar 4 speed gearbox with ‘C Type’ ratios to replace the 3 speed Ford Pilot ‘box. The tail of the Allard was replaced with a narrower one, the front and rear guards removed and wire wheels adapted to Lancia hubs fitted. The light car now developed circa 300bhp and was a formidable, noisy and spectacular weapon at the time. Over the next couple of years the J2 competed widely, mainly driven by Hawkes but occasionally by Reg Robbins who maintained it- it was also driven by John Sawyer and Adrian Gundlach. 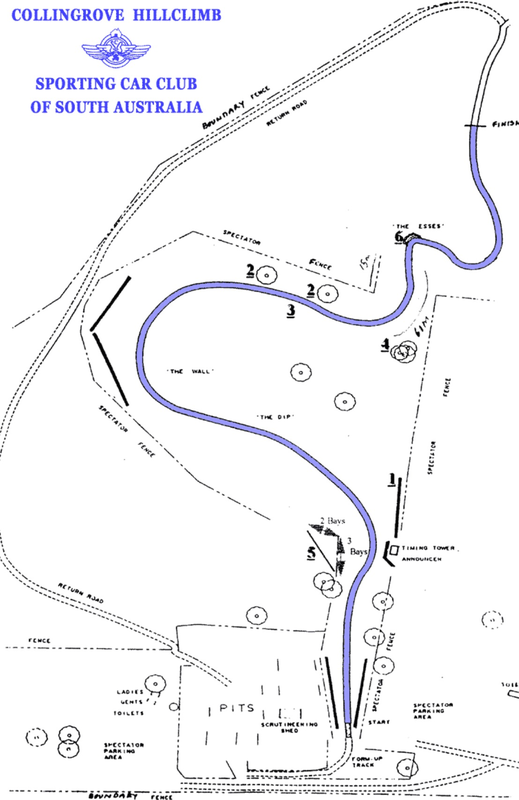 The car raced at Fishermans Bend, in Albert Parks inaugural 1953 meeting and Rob Roy, all in Victoria. 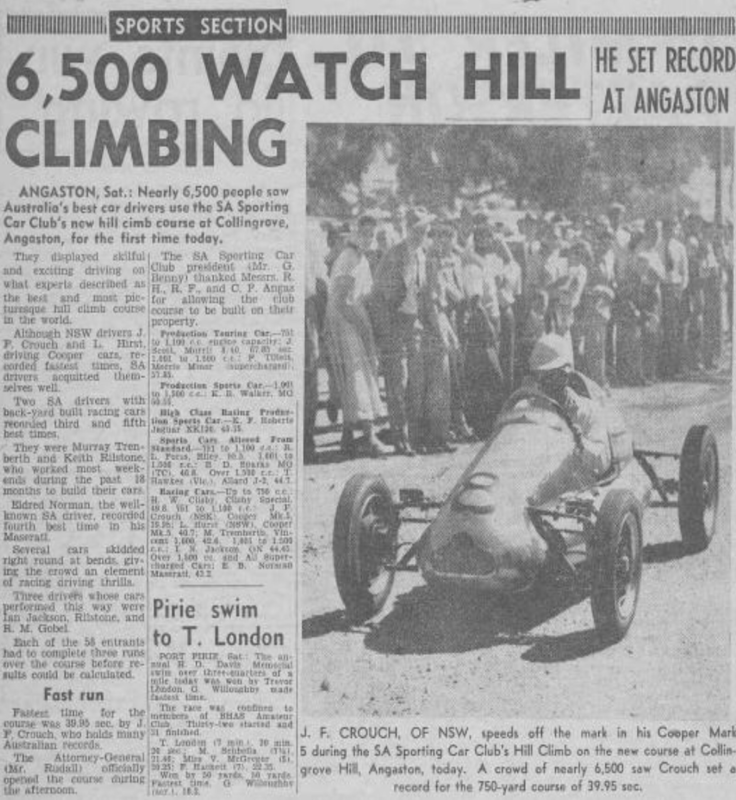 Hawles competed at Collingrove Hillclimb, Sellicks Beach and Port Wakefield in South Australia. 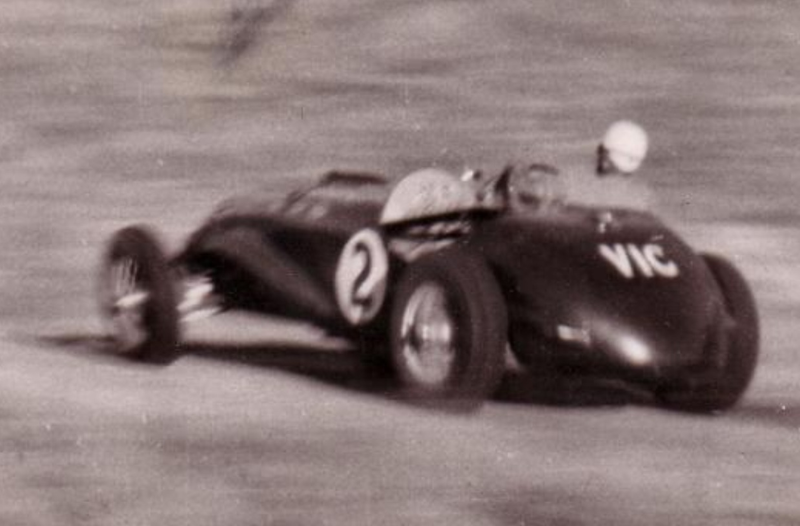 He travelled to New Zealand for the 1954 NZ Grand Prix meeting at Ardmore in January. There the car blew the OHV engine in practice, a stone pierced the radiator. The side valve engine was fitted for the race, famously won by Stan Jones in the Maybach after an amazing overnight engine rebuild. The J2’s Ford engine was brittle and ‘popped’ comprehensively at least 3 times, twice with rod failure, the errant component carving the cast iron block in half on both occasions. The J2 was very quick though, it recorded 137 mph on Longfords ‘Flying Mile’ during the 1955 Tasmanian Trophy meeting. Hawkes advertised # 1731 for sale in October 1955 but continued to race it before being finally bought by Reg Robbins who had been preparing the car for Hawkes as noted above. He raced it at Phillip Island and Rob Roy in late 1956 and early 1957 respectively before sale to Geoff McHugh in Tasmania. Melbourne’s Ian McDonald repatriated it from a Tasmanian ‘chook shed’ in 1964 and restored it, a process which took 2 years. He first raced the car in an historic event at an open meeting at Sandown in 1966. The car has passed through numerous sets of caring hands since then and is still in Australia. 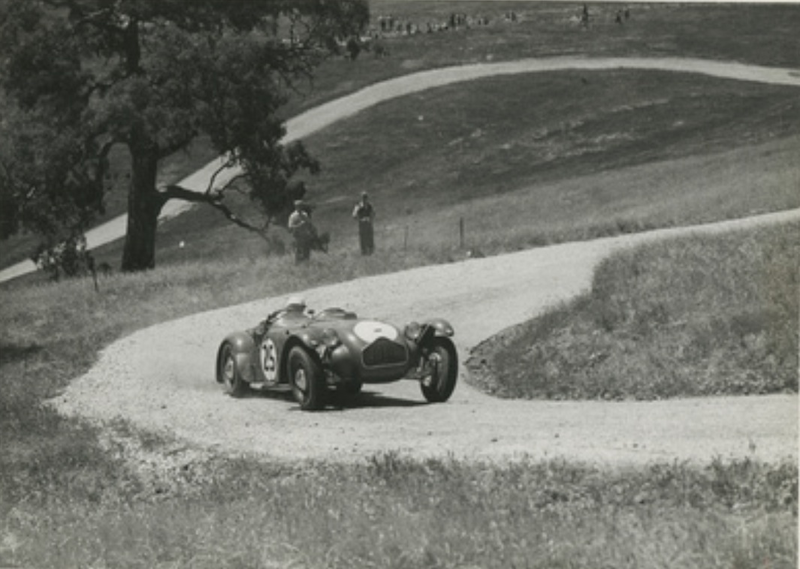 In the the 1930s Sydney Allard was successful as a British Trials and Hillclimb competitor with his Allard Specials. Operating from Adlards Motors, a Ford dealership he acquired in 1929, Allard competed successfully in international motor racing. 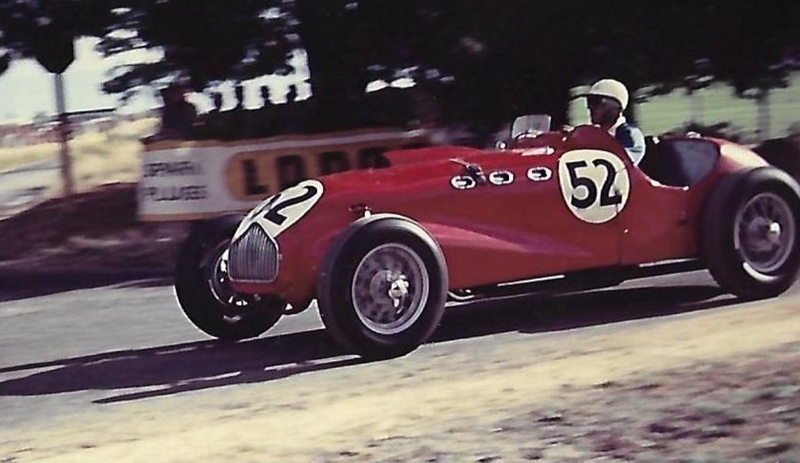 He was 3third at Le Mans in 1950 and victorious in the Monte Carlo Rally in an Allard P1 in 1952. 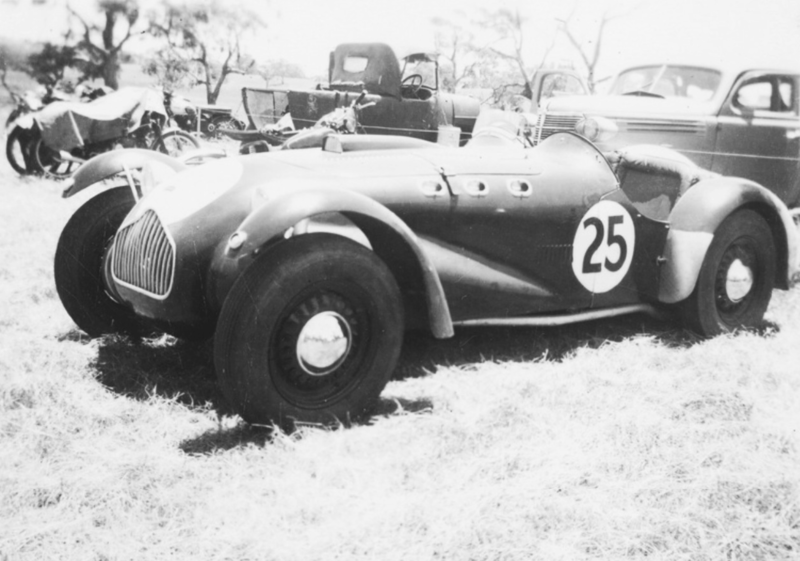 After racing first on motorbikes he moved to four wheels, in 1936 the first ‘Allard Special’ was built. Allard’s first cars were based on Ford products. The first ‘CLK 5’ combined a Ford Model 40 chassis and engine with a Bugatti Type 51 body. Its light weight and ground clearance made it an ideal Trials racer. By moving the cockpit as far backwards as possible, Allard concentrated weight over the rear wheels, a design principle of all future Allard’s. With Ford’s flat-head V8 providing plenty of power it was competitive immediately. Pre War a small number of Allard Specials were built powered by either the Ford V8 or Lincoln V12 and were race winners. During the War Adlards Motors repaired damaged military vehicles…and Sydney designed a new sportscar, which was built in 1946 and is now referred to as the J1. Ford components formed the basis of the car. A braced and boxed frame housed a Ford 3.6 litre V8 and 3-speed gearbox. Suspension was by a split axle at the front and live axle at the rear, transverse leaf springs were used front and rear. A full width body was fitted, but the guards could be removed and replaced by cycle-guards to turn the J1 Sports into a Trials car. Twelve J1s’ were built and competed in Britain and in Europe, its shortcoming was the flat-head V8, which was underpowered and overheated. readily. 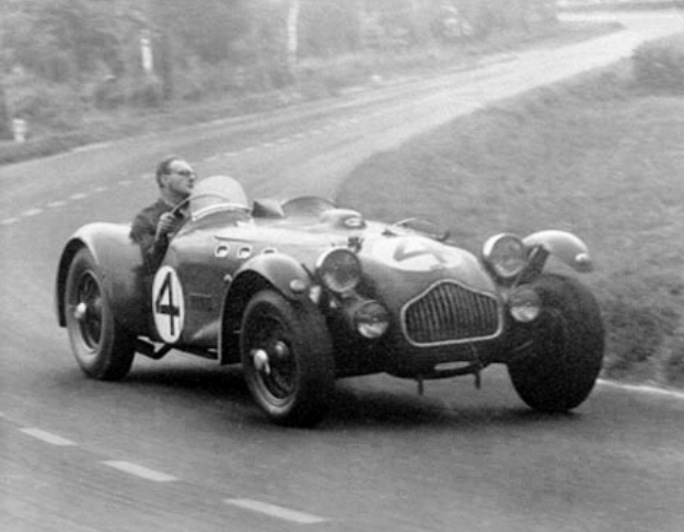 Allard then built, in larger numbers the K1 sports two seater, L-Type Tourer and M-Type coupe. 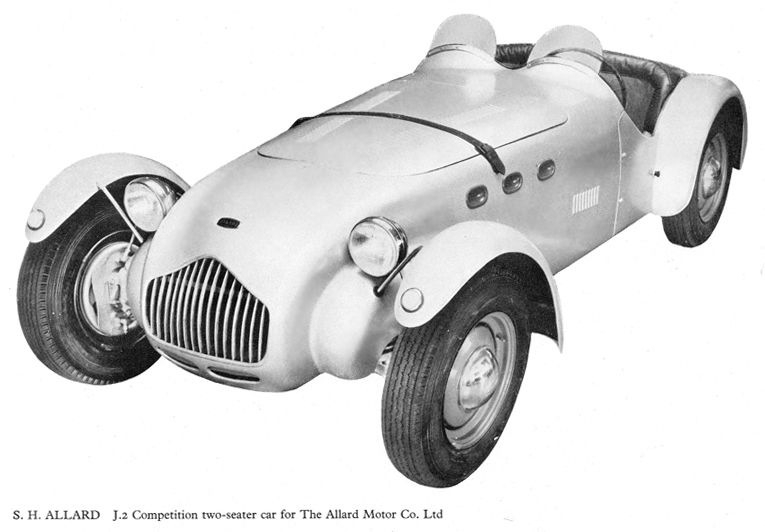 In 1950 Allard launched the J2. Based on the J1 design, the new car was designed with the J1’s shortcomings in mind. 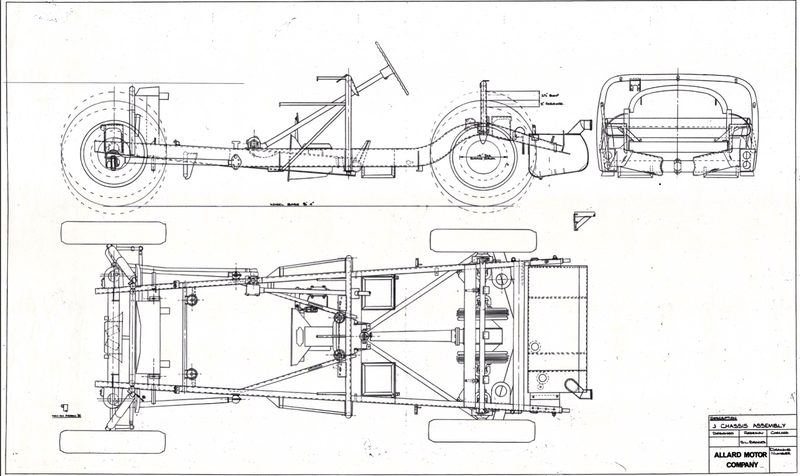 The front suspension was similar, the transverse leaf springs were replaced with coils at both front and rear- and a de-Dion axle was fitted with inboard drum brakes at the rear. The combination of rear weight bias and better rear suspension gave the car much better traction. Modified Ford sidevalve V8’s were Allard’s engines of choice, but the chassis was built to accommodate other engines, with Cadillac’s pushrod V8 the J2 was ‘in a league of its own’ and very successful in the US. 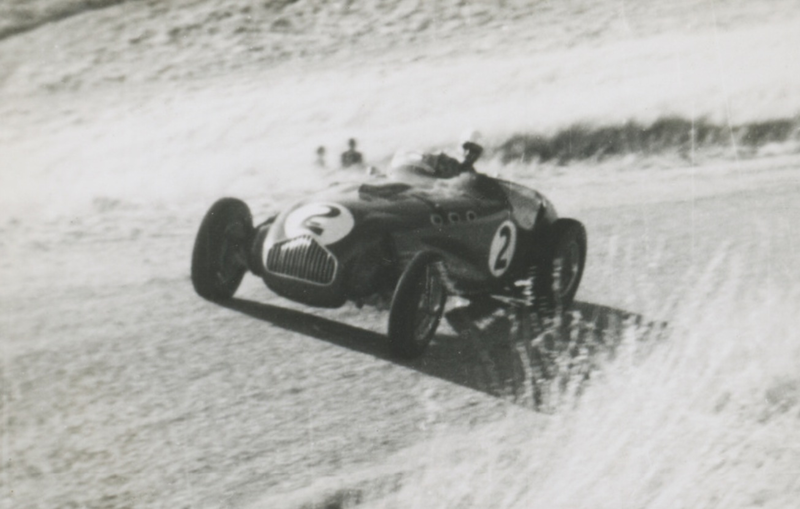 ‘Allard’s biggest road racing success was in 1950, when Sydney Allard and Tom Cole drove a Cadillac powered J2 to third place overall and a first in class at Le Mans. In 1951 a slightly modified version, dubbed J2X was introduced. It was similar to the J2, but the engine was mounted further forward to allow a larger cockpit. 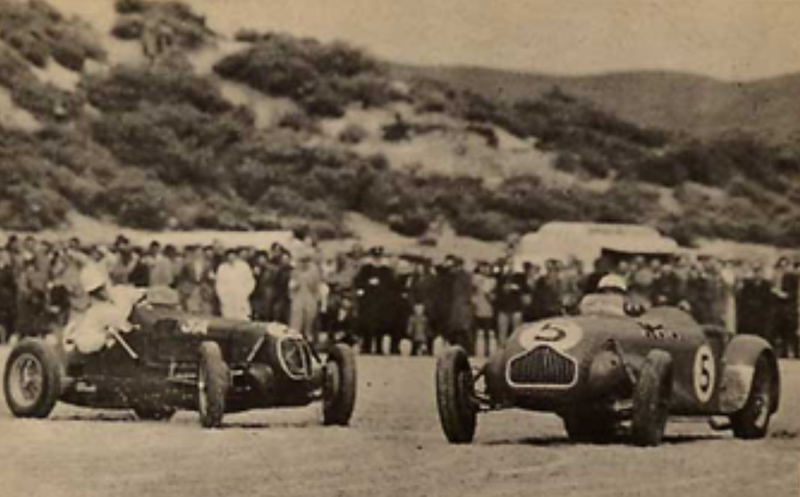 Chrysler Hemi and Cadillac powered J2s and J2Xs dominated racing in America. The final evolutions of the J2 were the J2X Le Mans and JR, which both featured a fully enveloping body’, wrote Wouter Melissen in ultimatecarpage.com. After 1908 Allards were built production ended in 1959. Increased competition from Jaguar, Lotus, Austin Healey and others producing quality production sports and racing cars made the going tough as the sixties dawned but the company and its clever products ‘punched above their weight’ very successfully for many years. 90 J2’s were built from 1949 to 1951. Cars delivered to the US were usually ‘sans engine’ allowing the customer to choose. Those with ultimate performance in mind specified the Cadillac or Chrysler ‘Hemi’ OHV engines with a wide variety of modifications available ‘off the shelf”. Specifications of the Ford Pilot ‘Ardun’ engine as fitted to #1731 and modified by Tom Hawkes; 3923cc, bore and stroke 80.96mmx95.25mm. Compression ratio 8:1. Magneto ignition. 2 Solex carburettors giving a claimed, and i suspect very optimistic, 300bhp. The cars chassis was a ladder or box section frame having a wheelbase of 100 inches and track of 56/52 inches front/rear. Front suspension was Allard divided or split axle with coil springs and hydraulic shocks. A de-Dion setup was deployed at the rear again with coil springs and hydraulic shocks. Drum brakes were fitted mounted outboard at the front and inboard at the rear.